This well-located resort has both bay and ocean access for families. San Diego is "America’s Finest City." I should know; I used to live there and miss it every day. There’s just something special about this Southern California gem: the beaches, the bay, the people, the surf, the sand, the attitude. It’s all about “chillaxing,” as Californians say. And staying at the Catamaran will leave your family stoked. The Catamaran Resort Hotel and Spa is located on San Diego’s Mission Bay and across the street from the Pacific Beach shoreline. I repeat: it’s literally on the bay and across the street from the beach. The location doesn’t get much better. Instead of staying on busy Mission Beach, treat your family to a bayside stay. It’s quiet, inviting, and downright picturesque. I really consider the Catamaran an ideal home base in San Diego. It’s steps from the bayfront walking path, giving guests the option to stroll, ride or run outside their hotel door. You can walk to a local playground located on the sand. You can walk to the grocery store. You can walk to downtown Pacific Beach. And you can walk to Belmont Park, the entertainment district on Mission Beach. Simply put, it’s extremely convenient. For KidTripster's top 10 recommendations for things to do in San Diego, click here. The Polynesian-themed San Diego hotel has 310 guest rooms and suites, each with a private balcony or patio. While the property as a whole is a tad outdated, it boasts immense character, pizzazz, and comfortability. I’ve stayed here more than once; I always leave satisfied and wanting to return. The lobby is exotic. Guests are greeted by koi fish and parakeets. There are an array of rooms and suites; all accommodations have a private balcony or patio. I like the bayfront room; the beach became our temporary backyard. The rooms are nice, nothing over the top, but comfortable and clean. KidTripster Tip: Ask for a complimentary room upgrade. It never hurts! Fall in love with the bay. It’s a perfect spot for young kids to play in the sand and swim. Truth be told, it’s not as noisy or crowded as Mission Beach. In my opinion, the bayside is much more calm and welcoming for little kids, while the oceanside is more for big kids and adults. The property provides lounge chairs, but you’ll want to bring a blanket for the sand, plus any other beach necessities. You can really morph into a Californian by checking out the property’s Action Sport Rentals. There are paddle boards, sailboats, kayaks, surfboards, bicycles, and Segways for rent at an additional cost. The resort also has an outdoor pool and hot tub. The pool is great for a post-beach swim, and there’s a bar where parents can order a much-needed happy hour cocktail. Exercise with a view; the fitness center is just steps from the beach overlooking Mission Bay and the boardwalk. The resort even offers beach cruisers to ride along the beach or bay. While these come at an extra cost, I highly recommend sightseeing via bike. Finally, the Catamaran has San Diego’s only beachfront spa, offering a South Pacific-inspired menu of treatments with only all-natural marine and botanical elements. I didn’t get a chance to indulge last time, but it’s on my to-do list. The property has two good restaurants: Moray’s and Oceana Coastal Kitchen, each featuring patio dining only steps from the beach. We ate at both; they’re equally satisfying and convenient. Moray’s is a beautiful setting for breakfast or happy hour, both casual and welcoming for families. Enjoy seasonal live music on the patio. 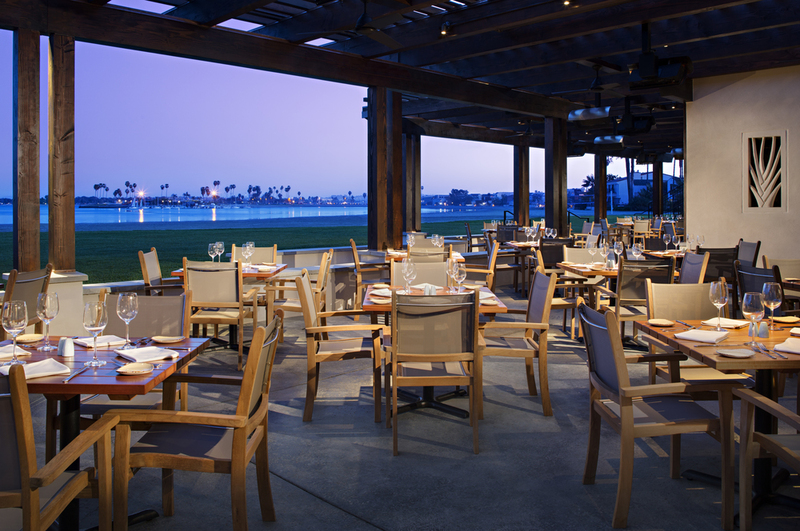 Oceana Coastal Kitchen offers a memorable bayfront dining experience. The contemporary eatery specializes in a cold bar with sushi options, small bites, and main dishes including the fresh seafood available from the coast of Baja and the Pacific. KidTripster Tip: Pack your own munchies. Utilize the in-room fridge and stock up on snacks. There’s no need to overspend always eating out. And this is cool: check out the Catamaran’s seasonal luaus. The San Diego summer tradition is a festive celebration of Polynesian food, music, and dance. Your kids will love it! My two-year-old got in the Aloha spirit by dancing the night away. The luau experience includes a lei, Mai Tai, all-you-can-eat buffet, and entertainment. KidTripster Tip: Refer to the luau calendar to reserve your spot. It’s usually twice a week, June through September. The Catamaran Resort and Spa comes with at price, especially during peak season (holiday, spring break, and summer vacation). A standard room for a weekend in June, for example, can cost you roughly $350/night, excluding parking fees. A bayfront room over spring break can go for $500/night. However rooms start at $229 in October, so if you can get away in the fall, it’s a better deal. There’s no resort fee, but you must pay to park. KidTripster Tip: If possible, I suggest visiting in the fall or winter. You’ll still likely catch some San Diego sun but for a whole lot less money! KidTripster Tip: Shop specials. The resort offers plenty of package deals and discounts that include day trips to SeaWorld, San Diego Zoo, Safari Park, LegoLand, and more. Whether you’re visiting San Diego or planning a staycation, you really can’t beat the location, amenities, and natural beauty surrounding this resort. Nadine Bubeck is a Scottsdale, Arizona-based mom of two young boys. She is a former television news anchor turned all things mama. Read her blog, buy her book, or shop her apparel line, Mama B. Designs. Use the coupon code KIDTRIPSTER for discount! This writer received a complimentary stay for the purpose of this review. However, all opinions expressed are solely her own.